The Minister of Women Affairs, Aisha Alhassan, has been summoned to the Presidential Villa. The Minister who was sighted around 2:24pm leaving the Presidential Villa was cornered by State House Correspondents to react media report credited to her that she will support Atiku Abubakar, former vice-president, if he decides to run for office in 2019. 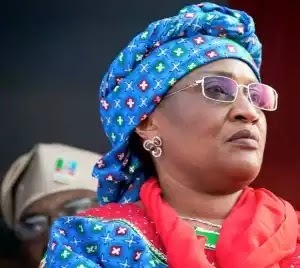 Alhassan was seen leaving the Office of the Chief of Staff, Abba Kyari who was said not to be on seat at the time she came calling. She was neither seen by President Muhammadu Buhari nor Vice President Yemi Osinbajo. In a video which went viral on Wednesday, the minister declared support for the former vice-president. This has sparked condemnation, particularly among supporters of the All Progressives Congress (APC). When reporters to explain her remarks, the minister who was responding to questions while walking to her car, referred newsmen to the interview she granted the BBC Hausa service saying her position has noted changed. On whether she is confident that she can retain her job, she replied, “God gives and God takes. That is all and I have said it all in Hausa. You know that there is an end to everything. The Minister had in an interview with the BBC Hausa, described Abubakar as her godfather, saying she does not mind losing her job for supporting the former number two citizen. “Atiku is my godfather even before I joined politics. And again, Baba Buhari did not tell us that he is going to run in 2019,” she said. “Let me tell you today that if Baba said he is going to contest in 2019, I swear to Allah, I will go before him and kneel and tell him that ‘Baba I am grateful for the opportunity you gave me to serve your government as a minister but Baba just like you know I will support only Atiku because he is my godfather. If Atiku says he is going to contest.